1. Toy Kingdom and Toy Kingdom Express- I always look forward to Toy Kingdom's and Toy Kingdom Express' Toy sale which happens almost all-year round. 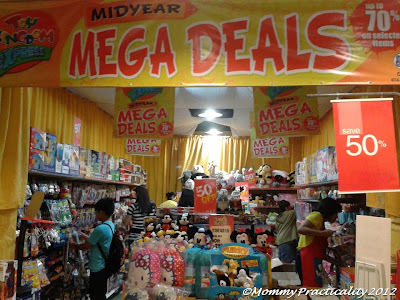 If you're the type who shops early in the year or throughout the year for gifts and take advantage of undeniably good toy sale, then go and check for Toy Kingdom's schedule of sale through their website, their Facebook Page or follow them on Twitter. 2. Toys "R" Us - At the start of BER months, Toys "R" Us start their private sale and regular toy sales. I too have been shopping for not only Christmas gifts at Toys "R" Us, but for birthday giveaways or game prizes for my sons' birthday parties. 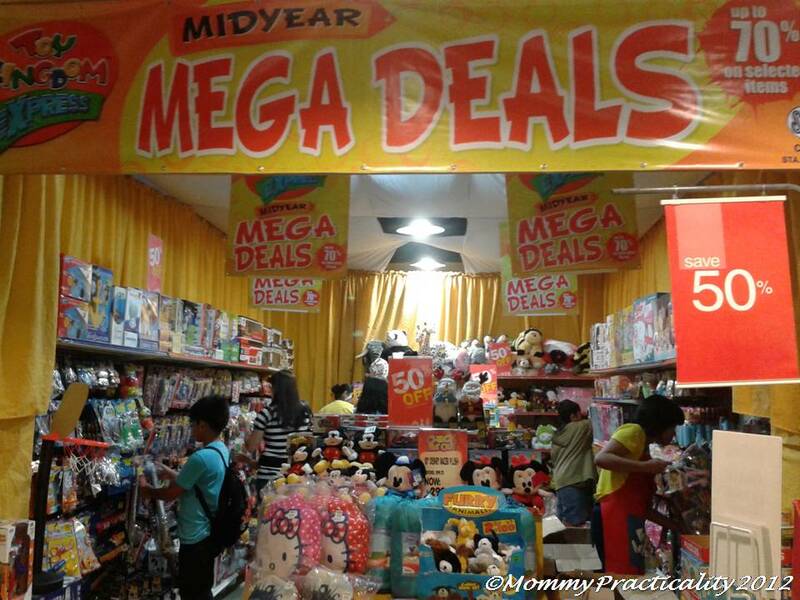 This November 14- 19, Toys "R" Us is having another BIG TOY SALE at the Trinoma Mall in Quezon City! Take advantage of this 6-day toy sale and enjoy up to 70% off on your favorite toy brands. Regularly visit Toys "R" Us' website, Facebook Page or follow them on Twitter for more updates. 3. National Book Store - There's so much you could purchase at National Book Store. Whether it be books or educational board games or journals, it's all there! National Book Store have had book sales since August which I wrote about in my previous post. On November 15 - 18, they are going to have a Warehouse Sale of up to 80% on books, supplies and gift items! For more updates, visit their website, like them on Facebook or follow them on Twitter. 4. SM Stores/ SM Department Stores - No one would ever go wrong if you buy gifts at SM Supermalls or SM Department Stores. Gift choices for infants, toddlers, children, teens, men and women are all there. They surely got it all for you! Plus with SM's all-year round 3-Day sale at over 40 branches nationwide, you really get value for money when you shop for gifts earlier. For SALE and event updates, visit their website, like their Facebook page or follow them on Twitter. 5. Robinsons Malls - Robinsons has around 30 branches nationwide to date and has also been having its clearance sales and thematic sales all year round. You can find any gifts both for the young and not so young, men and women here as well. For more updates on Robinsons Malls' sales and events, visit their website, like them on Facebook or follow them on Twitter. 6. Ayala Malls - Ayala Malls comprise of the following malls: Glorietta (Makati), Greenbelt (Makati), Market! Market! (Taguig City) Alabang Town Center (Munitnlupa), Trinoma (QC), Bonifacio High Street, Ayala Center Cebu (Cebu City), Marquee Mall (Central Luzon), Abreeza (Davao) and Harbor Point (Subic, Olongapo City). Ayala Malls are for the higher-end gift shopping. They boast of a number of signature boutiques and a lot of local shops too which individually has store sale all-year round. For more information, visit their website, like them on Facebook and their Events page or follow them on Twitter. 8. Greenhills Shopping Center - Chtistmas Bangketa is happening on November 15 to January 7. This is one of the most awaited time of the year. Next to Divisoria, this is the Cloud 9 of bargain for quality finds from over 2,000 indoor and outdoor shops. Christmas gifts for all ages could be bought at Greenhills. They have scheduled tiyangges all year round for those who want to avoid the rush of Christmas shopping. For more details, visit their website, like them on Facebook or follow Greenhills on Twitter. Great list! These are truly some of the best places to go shopping this Christmas season. I'll be in Manila later this week so I am jotting down all your suggestions. Thanks! True! :) Free gift wrapping pa! Like Farida, Christmas is also my favorite time of the year for various reasons, especially the sales LOL. We don't have branches of the stores you listed in my city but no worries, I'm sure there'd be plenty of things to buy come December. Oh dear.. Thank you so much! :) Will check it! There must be an SM near you? =) Thanks LadyMoxie for the visit! wow, nice list you have here :-) my favorite is Divisoria!